For men with beards, graying hair can be really taxing. Most men opt to dye their beards, but it’s a temporary and time-consuming solution to the problem. To reverse graying hair it’s important to understand why hair turns gray in the first place. Gray hair starts with the depletion of pigment, called melanin, in your hair that is normally produced by melanocyte stem cells. To maintain this pigment, your body produces catalase enzymes. These enzymes prevent the oxidation of melanin to maintain your natural hair color. Unfortunately, factors like age, health, and environment can slow down or completely stop the production of these enzymes, causing melanin to break down and your hair to lose its color. This natural process can be attributed to numerous factors such as genetics, poor nutrition, especially vitamin B12 deficiency, thyroid diseases, pollution, stress, and an unhealthy lifestyle, including habits like smoking. To find out how to combat the wide range of causes of graying hair experts at Reparex have conducted rigorous tests and experiments to treat the root causes of gray hair and develop a product that permanently restores hair color rather than temporarily covering it up. For years, men have been resorting to hair dyes to cover up gray hair. In most cases, instead of restoring their ‘natural’ color, dyed beards often look too dark and the change in color happens so abruptly that people notice it more than the gray hair. This temporary solution fades quickly and becomes a time-consuming routine to maintain. There are of course, recommended methods to prevent rather than treat gray hair, like reducing stress, maintaining a healthy lifestyle and refrain from bad habits like smoking. According to studies, reducing stress has more benefits than we can imagine. Our overall mental health actually affects the occurrence of graying hair, so it is important to relax and enjoy things from time to time. Nutrition is also very important to consider if your hair is graying. Your hair and nails are made up of a protein called Keratin and eating protein-rich food will definitely affect the appearance of hair. Foods that are recommended to maintain healthy hair and nails include dairy products like cheese, milk, butter, green leafy vegetables like spinach, almonds, berries, orange, salmon, and even dark chocolate. Hydration is also critical to maintaining healthy hair. Dehydration stops the transport of melanin to the follicles and will also contribute to gray hair. These healthy habits will help prevent gray hair, but its just as important to quit unhealthy habits that can cause graying hair like smoking. These are all useful approaches to prevent graying hair, but what if you already have gray hair? This is where Reparex comes to the rescue as a Gray Beard Formula! There are so many Reparex users that can testify to its effectiveness. Most of these satisfied customers have already tried numerous products and solutions but Reparex was the only treatment that really worked. 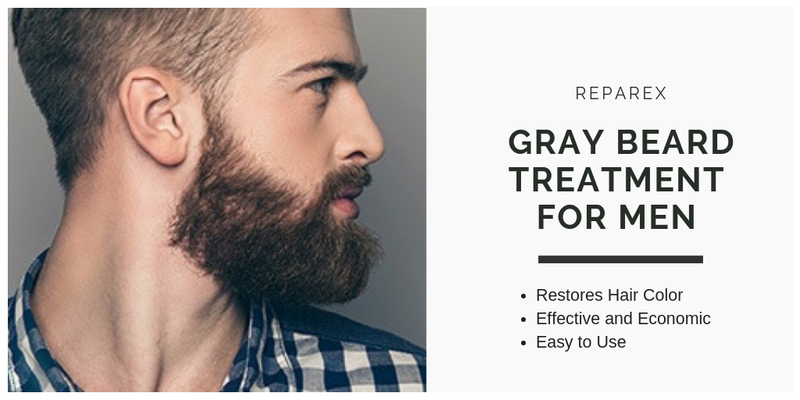 We have also shared a guide to Reverse Gray Hair in 14 Days with no Side Effect. Reparex is a liquid that can be easily applied directly to the hair and scalp, restoring hair color naturally by re-starting the processes that maintain healthy hair from the follicles to the hair strands themselves. When Reparex is absorbed it takes the role of catalase enzymes and restores the health of melanin pigments in the hair. Unlike hair dyes, Reparex will gradually affect the color of hair, transitioning back to your natural color without the harsh contrast that dying your hair creates. The best part is, after you start using Reparex, you will see results in just 7-14 days! Gray hair is a natural part of aging. We at Reparex understand that you have been looking for the best treatment for graying hair and we want to reward your long search with the best formula that our rigorous tests and experiments have produced. You will no longer resort to spending thousands of dollars trying to keep up with the latest fads or hair dye. We want to give you a solution that requires less of your time and energy, and a guarantee that in just a few days of use, there will be visible results.